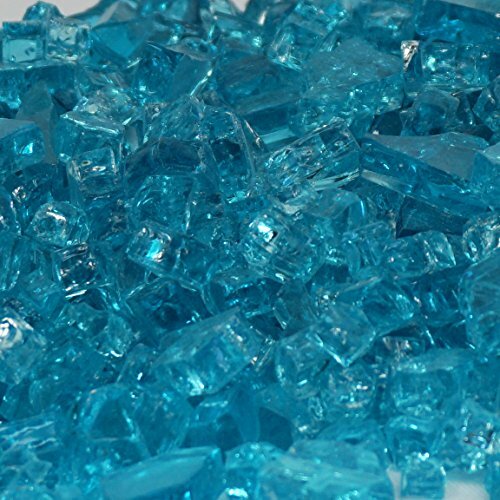 1/4" Caribbean Blue / Azuria Fireglass 10 Pound Bag | Fountain City Art Ctr. This is our Caribbean Blue / Azuria FireGlass. The Fire Glass is approximately 1/4" in size. The quantity is for 10 pounds of glass. If you need 50 pounds, order quantity of 5, if you need 100 pounds, order quantity of 10. 8 pounds covers approx 1 sq. ft. 1 inch deep. Great for Fire Pits and Fireplaces or Fountains or any Water Feature.